Of all of the things I’ve ever made, the project that gets the most compliments, hands down, are the earflap hats that I knit for my daughters. Everywhere we go it seems, people rave about how cute they are. 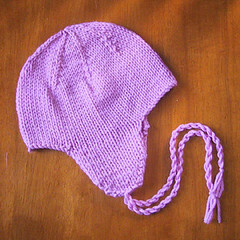 I’ve also noticed that I get a ton of blog traffic from people who are looking for a baby/kids’ earflap hat pattern. It didn’t take much dinking to convert the adult pattern I use to kids’ sizes, in fact I’ve done it for a lot of people, I’d just never written it all up. 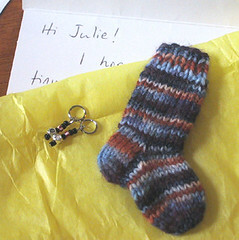 What follows is a version for DK weight yarn — I’ll eventually get a worsted version up too. Row 1: K1, P to last stitch, K1. Row 2: K1, Kfb, K to last 2 stitches, Kfb, K1. Repeat these two rows until there are 15 stitches on the needles. 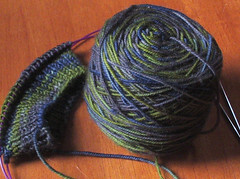 Knit straight until piece measures 2.75″ (3″, 3.25″). Cut yarn, leaving a 12″ tail, and leave the earflap on its DPN. Repeat for second ear flap. Using a cable cast on, CO 10 (12, 14) stitches on the circular needle. Knit the 15 stitches from first ear flap, then CO 24 (27, 30) stitches. K15 from second ear flap, then CO 10 (12, 14). Join, being careful not to twist stitches, place marker and begin knitting in the round. As you knit around this first row, you’ll notice four gaps, on either side of each ear flap. When you get to those, K2tog to close them up. At the end of the round, you should have 70 (77, 84) stitches on the needles. 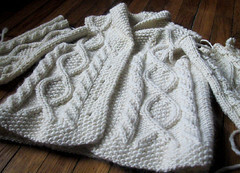 Decrease in this manner until there are 35 sts on the needles. Then decrease in the same manner, omitting the “k all sts” rows, until there are 7 sts remaining. Pull yarn through the last 7 sts with a tapestry needle, pull through to inside and weave in end. 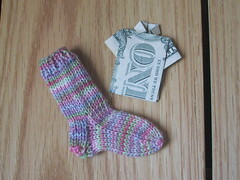 Wee bitty socks and money origami…yeah, that about covers it. Pics from this weekend. But first: thanks for the comments! They seem to be functioning fine now, so as long as I don’t start getting spam comments, I think I’ll leave the settings as they are. 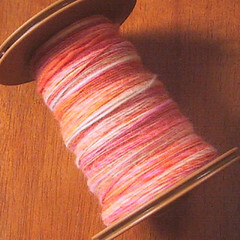 I plied a third of it with the remaining natural alpaca I had on the bobbin, and the rest with itself. I’m not in love with the merino/alpaca, but it is very soft, and the two yarns could definitely be used together in a project. The new Cast On magazine has an article about using multiple yarns together in one project that is quite cool. 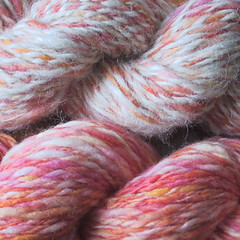 I forgot to take pics during the daylight hours today…more new handspun photos will be up tomorrow! Because so many people rave about it, I got my hands on a copy of “Spinning for Softness and Speed” through interlibrary loan. I’m so glad that I didn’t buy it, because really, what a waste it would have been…after trying the method described therein, I totally would have thrown it out the window. 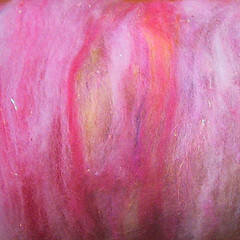 So I thought, okay, I will take out the yummy yummy fiber that i have been waiting to spin — alpaca/silk/angora or something like that. Super soft, lovely stuff. Mmmmm. I couldn’t spin it to save my life. Tried it on the wheel, failed miserably. 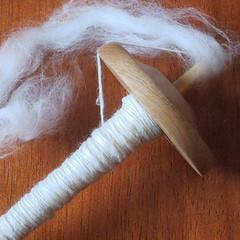 Tried to spindle it, did a little better, but it was not a fun nor a relaxing experience. In fact it made me pretty irate. I’m starting to feel a little more at home over here! I’ve got buttons! And a blogroll! 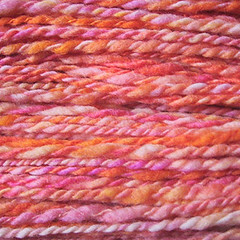 The header photo is my BFL and tussah silk plied together…if I do say so myself it turned out beautifully. About 300 yards, and I haven’t set the twist yet so I’m not sure what the WPI is. Seems DK-ish. It’s soft and scrunchy and I’m still thinking about what it might want to become.